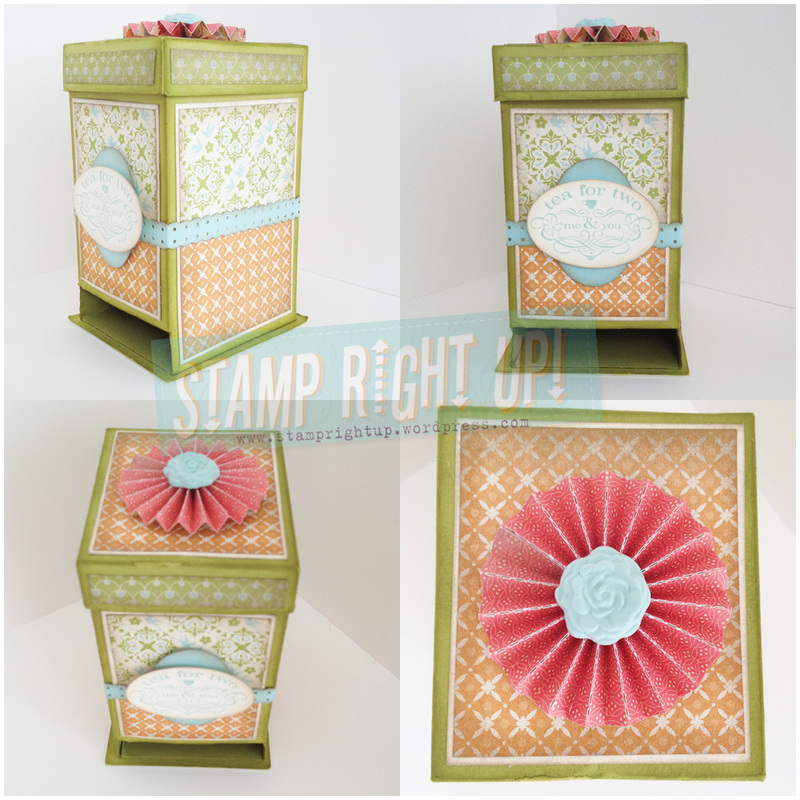 catalog | Stamp Right Up! It’s the flower blossom embellishment on top of the lid! I made it with the new Blossoms & Buttons simply pressed molds and pool party reinkers. I just LOVE LOVE LOVE the fact that we are now going to create embellishments in ANY color Stampin Up carries!! Now, all you have to do is order the reinkers and we can make our own buttons & flower embellishments!! There are 3 different sizes for buttons and 3 sizes for the flower blossoms, my example show on the lid is the medium sized ~ they are about the size of a nickel – I used pool party reinker to color the clay. The clay is EXTREMELY lightweight; it almost feels like styrofoam… It is a silicone compound. So they really are perfect for cards or any paper project! I personally tested each design to see how durable they are: the buttons I can literally fold in half and they didn’t break or crack; the flower cracked a little when folded completely in half, but it only shows if bent – so these are very forgiving and durable and will most definitely make it through even the most unforgiving postman. I cannot WAIT to show you more of these in the next few weeks! Official orders for the new catalog begin May 31st – I will have electronic AND digital copies ready as soon as we are able to release them. If you would like to be included on either mailing list for official hardcopy, or digital copy of the catalog please comment below as well and I will make sure you are in the know!